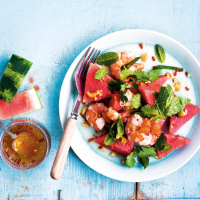 A characteristically bright, zingy salad from the Australian chef and food writer. The best thing about summer cooking is the lack of actual cooking! For me, it’s all about arranging fresh, colourful ingredients on large platters and allowing everyone to help themselves. For a more substantial meal, I serve this salad with Thai-style griddled chicken – simply slash chicken pieces to the bone and marinate with turmeric, garlic, fish sauce and a little sugar before cooking. Dry-toast the cashews in a frying pan over a medium heat until just turning golden. Transfer to a plate and set aside. For the dressing, pound the garlic, chilli and sugar in a pestle and mortar to make a coarse paste, then whisk in the lime juice, fish sauce and oil. Balance the flavour with more fish sauce or sugar to taste. Pile the watermelon and herbs onto a platter. Top with the prawns and salad onions; crush over the cashews. Drizzle over the dressing and serve.